To determine the success of an online marketing campaign, the e-commerce products that are generating the most user interest, or the popularity of your blog, you’ll need some form of statistical analysis. How many page views are there per month? Which pages are generating the most views? Where are your visitors coming from? You need a Web traffic analysis tool to answer these questions. 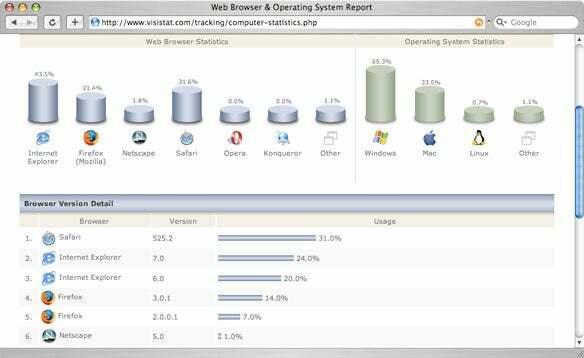 VisiStat 6.0, a managed service that integrates with any Web server, provides an easy-to-use interface for generating demographic data for small to midsize businesses and blogs, although it lacks some features found in traditional log file analysis tools. I found the ability to access information in real time to be the best reason to use VisiStat. Log analysis products like Webalizer generate reports as a snapshot in time—assuming you can even access your Web server logs; some hosted Web sites and blogs don’t give you that information. VisiStat updates continuously, independent of the Web server; it only took a few seconds to see my visitors show up on the analysis pages. Statistical and demographic data generated from VisiStat was on par with Webalizer or similar traffic analysis tools. I was able to see, for example, that my home page gets more visitors than any other page on my site; that less than one percent of those visitors are using the Linux operating system; and that “mike demaria” is the search phrase used most often to find my site. VisiStat presents such data with dozens of colorful charts and bar graphs. Most charts allow you to drill down and gather further data. In the chart showing visitors per day, for example, I could click on my busiest day and see a list of visitors per hour. I could then drill down further and see a visitor’s click path. VisiStat is smart enough to recognize and not include search engine spiders, which can make the hit counts appear higher than they should be. VisiStat’s attractive charts and graphics allow for easy viewing of visitor demographics, such as which browsers are used most often. You can configure VisiStat to send you an e-mail alert when the number of page hits or visitors exceed a specified threshold. You can also request additional alerts when a visitor’s ISP, region, IP address, or keyword search matches a particular text string. VisiStat offers an add-on product called PageAlarm to monitor your Web site for downtime. It checks to see if it can access a specified page every 10 minutes, and will send an e-mail alert if that page is unreachable. I set it up to send alerts to my cell phone whenever my Web server goes offline. Unfortunately, it does not do any content verification—that is, it doesn’t check to see if the page’s content matches an expected value. As it currently stands, VisiStat can’t differentiate between a working site and a site that produces error pages all the time. Nor does it send an “all clear” message telling you that the site is back up. At $30 per month, with no time limits or minimum time commitment, VisiStat 6.0 is affordable as a basic traffic analysis tool for the small business and blog market. The quality of its presentation gives it an edge over many free tools, and log file analyzers can supplement any missing statistical data. PageAlarm is a worthwhile investment if you are concerned about Web site downtime.